Old-fashioned tech deployed in “The End of TV” includes overhead projectors, shadow puppetry, and live-action silhouettes. From cradle to grave, we are awash in television images, spending countless hours suffused in their glow — especially now, when the triumph of screen culture over print culture is more absolute than it has ever been. So it might seem an audacious thing indeed to title a show “The End of TV,’’ as the Chicago-based performance troupe known as Manual Cinema has done. But of course the title is not meant to taken at face value. Nothing in this ingenious and spellbinding multimedia production is so linear as that. Yes, the quietly poignant story within “The End of TV’’ has to do with endings, but also with beginnings, and with the struggle in between those two poles of existence, and with the simple human connections that can make it bearable along the way. “The End of TV’’ also wants us to think about the emptiness of consumerism, the betrayal of workers by bottom-line-focused corporate America, the distance between real life and the promises made in television commercials, and the folly of believing that life’s meaning can somehow be commodified. But those messages are not new, and they are not the strength of this remarkable show. 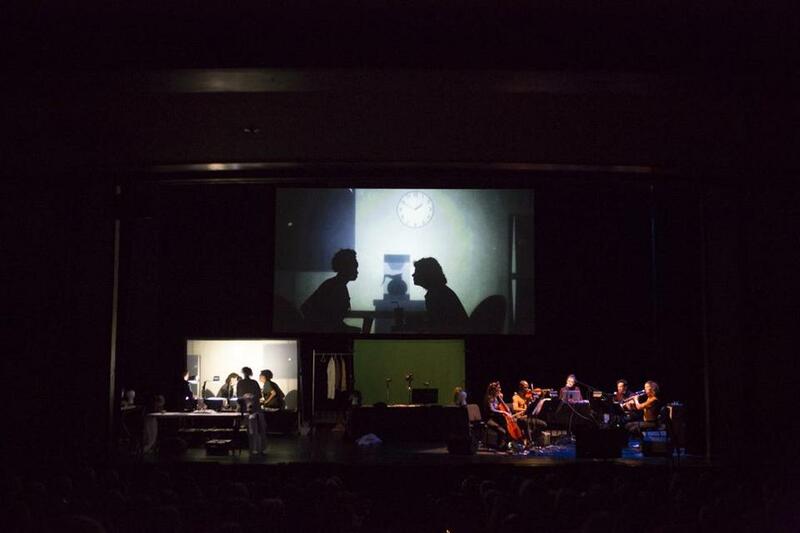 Among the small miracles of “The End of TV’’ — directed by Julia VanArsdale Miller and now at the Paramount Center under the auspices of ArtsEmerson — is the intimacy it achieves and sustains throughout despite its screen-centric structure. Often, when stage productions put technology at the center of their storytelling, as in Ivo van Hove’s current Broadway staging of “Network,’’ a certain coldness and remoteness can result. Not so with “The End of TV,’’ although it matters greatly that the tech deployed here is deliberately old-fashioned: overhead projectors of the sort you may recall from high school AV club, low-fi video feeds, shadow puppetry, live-action silhouettes. Flo once worked as a supervisor in the local automobile assembly plant but is now sliding into dementia, her days devoted to watching big-haired hosts hawking their kitschy wares on the QVC shopping channel — all bright, come-hither falsity and inanity — punctuated by a numbing cascade of commercials. Louise, who was recently laid off from her job at that same auto plant, now works as a Meals on Wheels driver, which brings her into contact with the older woman. Images of a hand turning a wrench on a bolt communicates the pride both women once took in their jobs at the plant; a foreclosure notice suggests the toll that unemployment takes.